Enjoy an Italian classic! 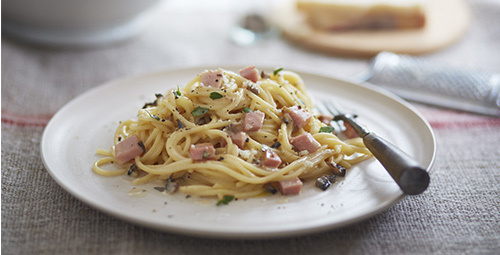 This creamy Bacon Carbonara is the perfect family meal and can be prepared in minutes. Delicious and filling. Cook the pasta in a large saucepan of salted boiling water according to the packet instructions. Drain well. Place a large frying pan over high heat. Add the oil, butter, onion and streaky bacon. Cook for approximately for 5 minutes or until bacon is slightly crispy. Add the cream and bring to the boil. Simmer for 2 minutes or until slightly thickened. Add the pasta and Parmesan Cheese to the frying pan. Stir through the sauce until heated through. Season well and garnish with fresh parsley and extra Parmesan Cheese.